I've never been this successful in my life! For the first time ever, I have seedlings that are developing their first true set of leaves! Look at that baby artichoke plant! 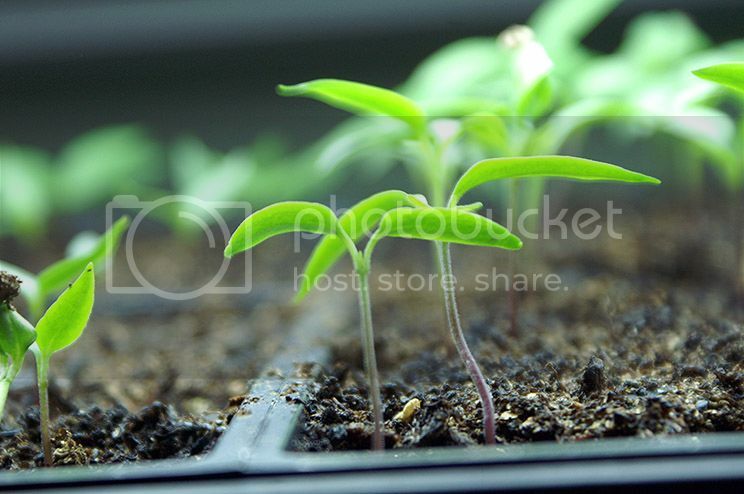 These little tomato plants just popped up a few days ago. And they haven't flopped over yet! 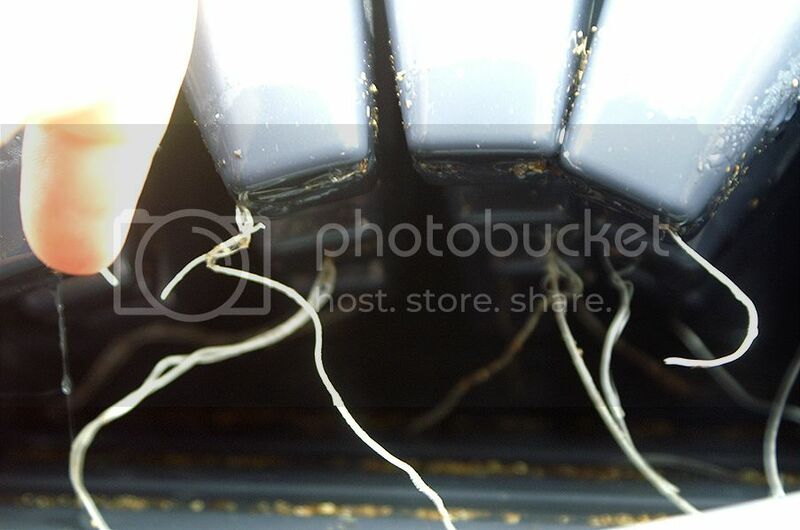 There are ROOTS sticking out of the bottoms. I've seriously never seen this before. In over a decade of attempts, I've never made it to the point where roots would be hanging out. I don't even know what to do! Are these still immature enough that I can leave them? Or do I have to transplant these babies? And I haven't thinned them yet, either. 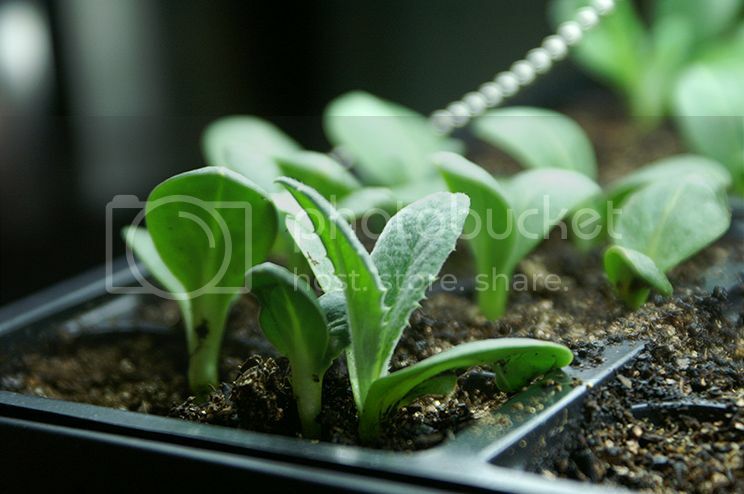 There are two seedlings in each little compartment. Do I have to kill one? Help me Obi Wan, you're my only hope! No advice for you since I've never done a day of gardening in my life - but they look GLORIOUS!!! 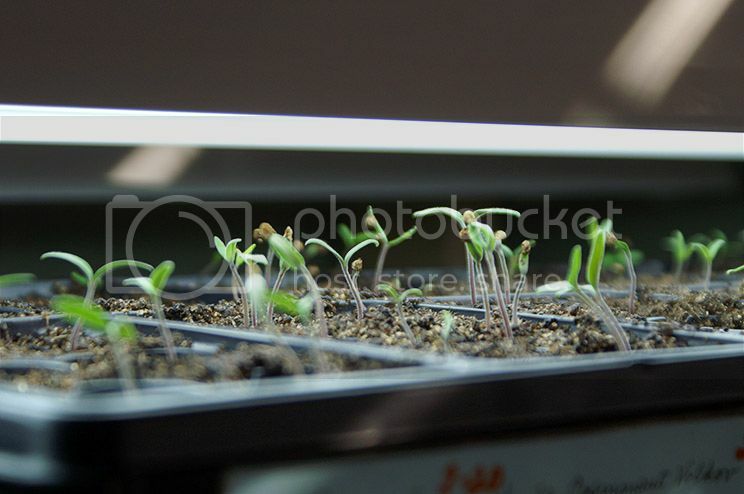 They look nice healthy seedlings !!! Thin them out and pot them on now. Hold all the soil around those with roots showing when you ease them out and then only hold the plant by the leaf not the stalk when you re-pot them. You don't have to kill one, you might as well see if you can rear all...what's to lose? If you've bought six-packs (veggies, not beer) from the nursery, you'll notice that the plants sometimes have matted roots. Yours have found a way out. No big deal - pinch them off. I have successfully transplanted the extra seedling when thinning. You have to be very careful naturally not to damage the delicate stems; so I'd wait a little longer until the seedlings are hardier. 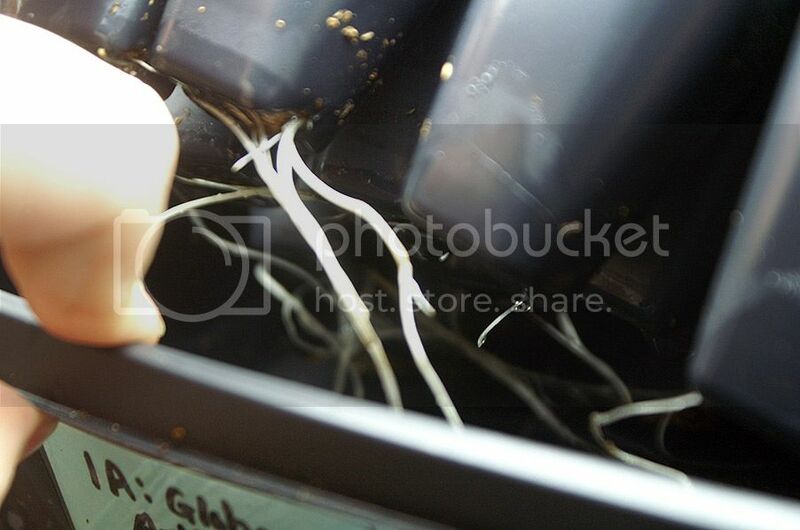 Instead of trying to pluck out the extra seedling to plant, take out the whole soil block and gently pull away the plants with it's soil and tuck it in an empty six-pack cell with more soil. But if you feel you have plenty, kill away without compunction. What a boost of joy :-D. Thanks, Lisa! I totally took your advice on re-potting the extras. I hope it works! Thank you! This put me at ease. Thank you for the advice, frauzehn! I probably saved more than I need to (I now have more seedlings than room for them in the garden), but I'm suspecting some will succumb to my recent aphid attack (that became a full-on infestation before I stopped it... oops).